Scientists at Pacific Northwest National Laboratory wrote an invited review on soft- and reactive-landing techniques, where a focused beam of selected ions are deposited onto a chosen surface. The review article provides a comprehensive look at ion landing instruments and research. Artwork by Nathan Johnson, PNNL Enlarge Image. When determining how complex molecules drive, hinder, or halt reactions relevant to fuel production, pollution abatement, and energy storage, scientists often contend with other unrelated molecules that obscure their studies. Some researchers avoid these troublemakers by using ion soft- and reactive-landing techniques. With these methods, molecules are precisely sorted by their mass-to-charge ratio, kinetic energy, and ionic charge state. The scientists can concentrate the purified molecules into a beam and control its size, shape, and position to prepare highly tailored films and structures. At Pacific Northwest National Laboratory, Dr. Julia Laskin, Dr. Grant Johnson, and Dr. Don Gunaratne took on the challenge of reviewing these techniques. They wrote a 40-plus page article in Mass Spectrometry Reviews that covers hundreds of studies. The authors were invited to write the review because of their expertise in developing ion soft-landing instruments and applying the instruments to fundamental studies in catalysis, materials synthesis, and energy storage. Why It Matters: Soft and reactive landing of ions create high-value materials, from novel films for catalysis and batteries to protein arrays for high-throughput biological screening. The team's article reviews decades of research, pulling out key examples and explanations. The article is of interest to those studying the properties of individual molecules and their mesoscale assemblies on surfaces. Methods: To determine the scope of the article, the team reviewed hundreds of studies from universities, national laboratories, and other institutions around the world. The article covers the instruments and their applications along with the structure and behavior of the materials produced. Special attention is devoted to small clusters, nanoparticles, and proteins. 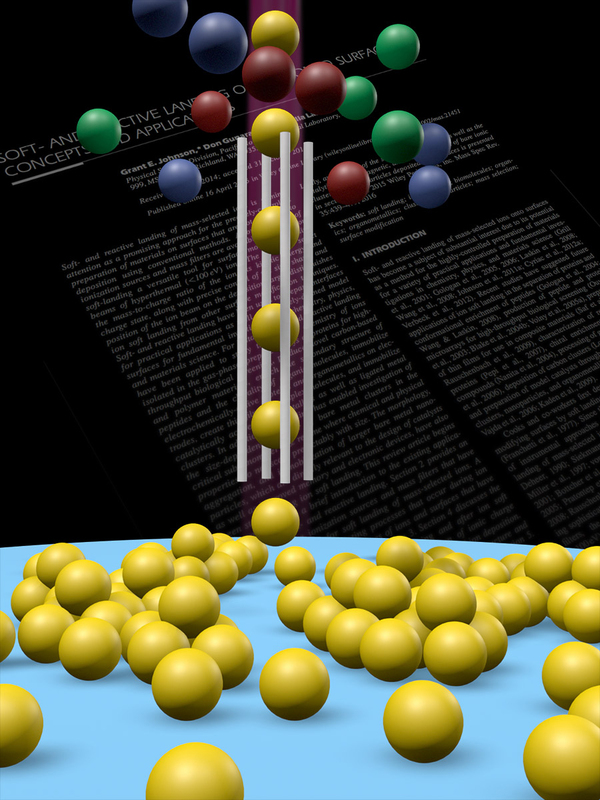 "Ion soft landing is a powerful tool for looking at the collective behavior of assemblies of molecules and clusters as part of DOE's new thrust in mesoscale research," said Johnson. What's Next? "The next stage for soft landing research is developing it to do 3D printing at the molecular scale," said Laskin. "We aren't there yet, but that's the research direction that will yield the largest payoff in terms of materials synthesis and other applications of interest to DOE." 100-character summary: Review article shares inside scoop on applications and future potential of ion soft landing. 1 sentence summary: At Pacific Northwest National Laboratory, three scientists wrote an invited 40-plus page review on soft- and reactive-landing techniques for Mass Spectrometry Reviews; the team's work provides a comprehensive look at ion landing instruments and research.